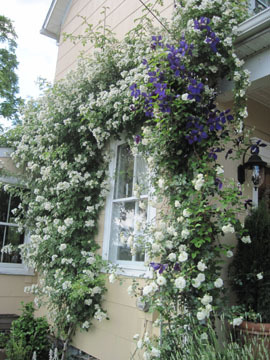 Several years ago, I was planting a rambling rose in the corner of the garden and wasn’t being terribly careful about it. A small piece of cane snapped off in my hand and instead of throwing it away, I absentmindedly stuck it in the dirt next to its newly created (and probably slightly bemused) parent. A week or two later while watering, I was surprised to see one of the nodes producing tiny leaflets – and cautiously pulled the stem out of the soil to see what was going on. A tiny network of threadlike roots greeted my surprised eyes. Thrilled, I gave the little guy his own pot, and in the fall found a new home for him. 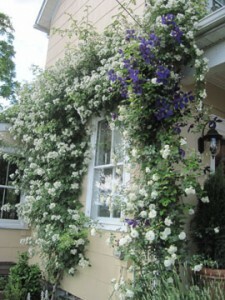 Today, he is a strapping example of a healthy twenty foot rambler, clothing the south side of my house in a thousand fragrant blossoms at the end of May. Ironically, his parent plant ended up in a retirement bed, and steadily deteriorated into hospice care by the end of that season. Imagine the effect a success such as this had upon my frugal heart! To that point I had enjoyed the self-propagating tendencies of true self-seeders and had reveled in the occasional offshoot from a vigorous rugosa or an enthusiastic syringa. I had divided perennials that begged for the sting of a sharp spade and had nurtured hundreds of tiny tomato seedlings on the top of more than one washing machine. But this? This was magic. Well, it turned out that as with many things in life, I was suffering from a bit of beginner’s luck. My propagating efforts did not produce hundreds of cloned plants to grace my garden for several reasons and all of them were squarely my fault. First, plants do not uniformly offer up their cuttings at the same time – one has to pay attention to specific schedules and growth patterns and take shoots accordingly. I am rarely paying attention to anything other than the next meal I have to make or how many times I have had to pick the hand towel off the bathroom floor that day. Second, if the planets align and I actually remember to take cuttings at the right time, I invariably leave them sitting on the garden bench; intending to pull out the vermiculite, pots and rooting hormone ‑ and fail miserably when children come outside at nine o’clock begging me to start dinner. 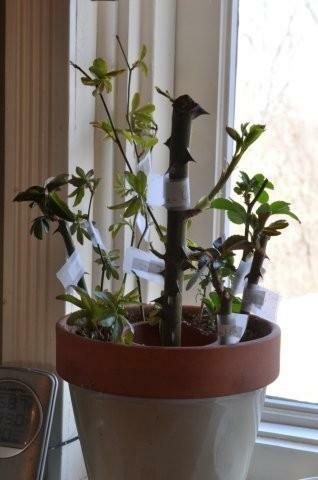 Third, if I actually got to step three, I would pot up my little cuttings, slap on a plastic bag for humidity and pray for the Watering Fairy to take it from there. Like the Tooth Fairy, she was fairly elusive, and in the end most of my cuttings walked the long green mile. And then I discovered the Forsythe Pot. Unlike other modern gardening miracles, I didn’t have to buy anything, and, assuming that I managed to make it through step one successfully, my prospects in the propagation department began to brighten considerably. The Forsythe Pot (with apologies, no doubt, to John Galsworthy) is a pot within a pot. An average glazed terracotta pot is filled with vermiculite. A second smaller pot with its drainage hole plugged (unglazed this time), is nestled down into the vermiculite and filled with water. Fresh cuttings lightly dusted with rooting hormone are placed in the vermiculite “ring” between the two pots. Over the course of a day or two, the water will slowly seep from the walls of the inner pot, keeping the vermiculite at a constant state of ideal dampness – perfect for getting those cuttings off the ground and rooted. 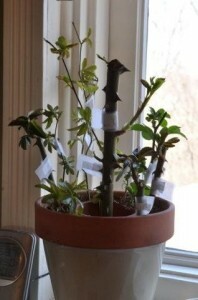 Once the cuttings have put out a fragile system of roots, they can be potted up and hardened off outdoors. The Forsythe Pot has literally revolutionized my propagation efforts. I still start hundreds of seeds in the spring and divide perennials until my hands ache; but now when I am in a friend’s garden and a bewitching green-shooted tempter gives me the come-hither at the right time of year, I know that the cutting I take has a very good chance of living to a ripe old age. I keep my little replica factory on my windowsill and the rooting hormone within dusting distance. Armed with a decent book on softwood cuttings and a Forsythe Pot of your own, you too can have all the happy endings you wish. If I could just make a pot big enough to clone myself, I might never have to pick up another hand towel ever again. Hmm-m-m…I have seen these in catalogs, but never knew if they were worth it. Thanks for the review! How often do you need to water? Only need to top up the water every other day or so – that seems to work for me. The terrific thing about this setup is that most of us have pots sitting around that will work. I have plugged the hole with a bit of sticky wax, but I have heard of people using corks or just using a pot with no hole at all – though I imagine that an unglazed one is hard to find.